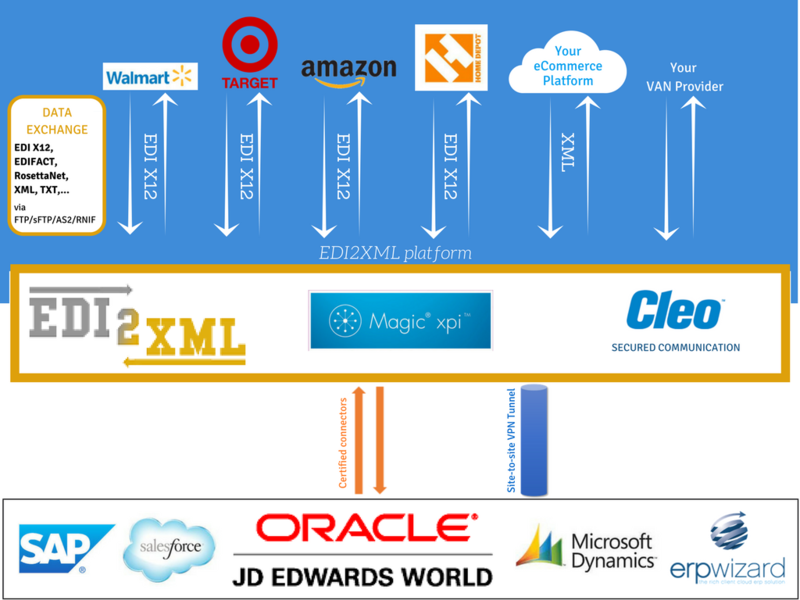 What is EDI2XML as a Service? 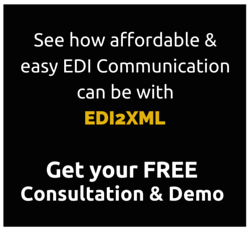 EDI2XML as a Service is our popular “fully managed EDI service”, including translation and communication service offering to businesses of all sizes, from various industries. All conversions of EDI files are done on our end, leaving customers with no on-site installation of software or hardware and an EDI project that is on time and within budget. Our EDI2XML Team will be in charge of going through the EDI integration steps: starting from the planning of the EDI project, to the design of the customer’s requested file format (XML, TXT, CSV), and to the testing and certification with the trading partner. No setup of any kind is done on our customer’s premises. We receive EDI files from their trading partner, on our customer’s behalf, we convert them and then send directly to our customer. We drop off and pick up all EDI documents to and from their Trading Partners’ servers. Our customers are alerted of these transactions via email confirmation notifications. A setup phase is required for all new Trading Partner and/or EDI document implementations. This phase includes the project analysis, setup of Trading Partner accounts, configuring Partner specs and platform, defining the transferring file structures, building and setting up all connectivity required, data testing and more. Please be aware, every setup depends on the collaboration of the Trading Partner(s) and the customer. 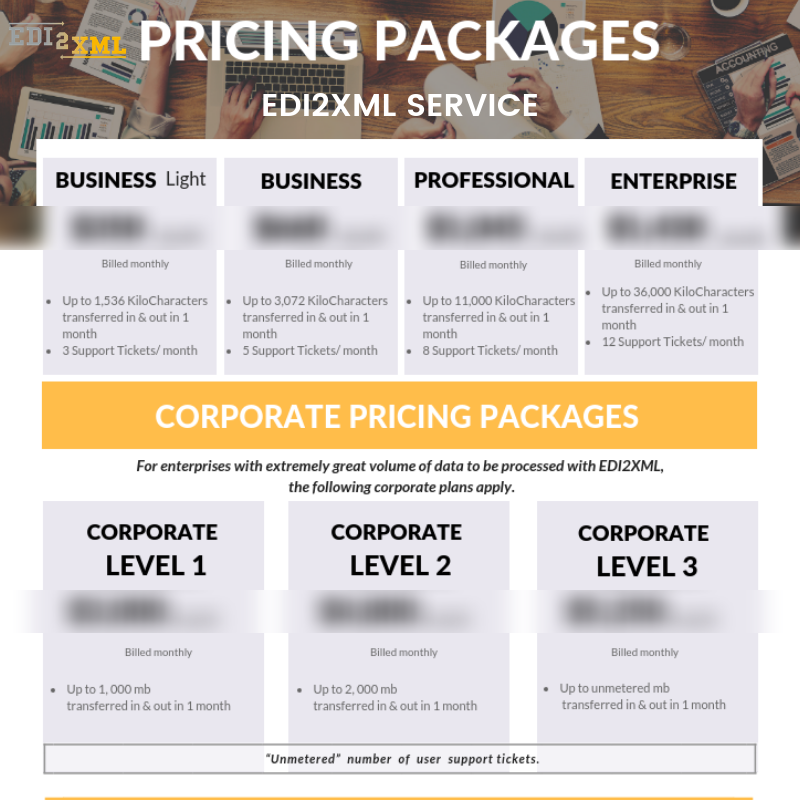 The monthly EDI2XML Service & Mailbox fee is based on pre-packaged pricing packages per month, that grow (and shrink) dynamically based on the volume of data processed during a specific month. Request our EDI2XML Translation Service Pricing Package here for more information.